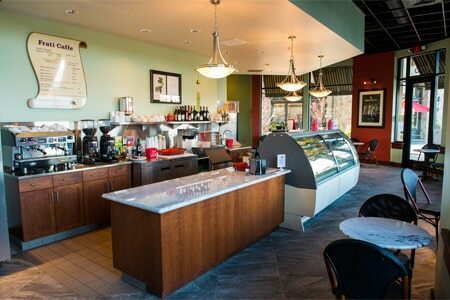 An array of gelato and sorbetto flavors offered daily as well as café options and paninis. : Frati Gelato’s Dr. LuPriore is the in-house “Master Gelato Maker,” creating more than 100 different flavors for the café and customers to enjoy. The gelato is low-fat, low-sodium and low-cholesterol, while the sorbetto is fat-free and lactose-free. Flavors range from traditional chocolate and cookies & cream to eggnog or Valentine Kiss---chocolate with a little hot pepper and cherry. Look online daily for the most current flavor choices at the café. The menu also features café options and paninis.